You can view Part I here and Part II here. Tom Brady. Peyton Manning. Both surefire Hall of Famers. Both in any rational human being’s all-time top 10 NFL quarterback list. But are they in the top 5? Are either of them the greatest of all time? If so, which one? In other words: who is better? The last 2 days, we broke down defenses, running backs, and offensive lines in an attempt to answer this question. By looking at what each QB was working with throughout his career, we can start to determine which factors a) helped their performance and (more importantly) b) helped their teams win games. One of the most oft used ways to evaluate a QB is wins. This is flawed for many reasons. As we stated in our first installment, there are hundreds of variables that affect the outcome of a football game. Quarterback play is linked to many of those variables. But many of those variables affect QB play. Some have nothing to do with QB play, but profoundly affect the outcome. So how can we make a blanket statement about wins defining the legacy of a QB? This isn’t tennis. Both Brady and Manning have won their fair share of games. 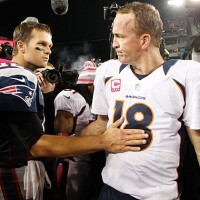 Brady’s Patriots are 166-50 with him at the helm, while Manning’s Colts and Broncos are 177-84. Pretty close with an edge to the Pats. However, the playoffs show a bigger disparity, with Brady’s teams going 18-7 (more wins than anyone in the playoffs…ever) and Manning’s teams are 10-11. The difference here is what leads most people to reflexively answer “Brady” when asked who the better QB is. What we need to try to figure out is just how much each QB played a role in their teams wins and losses. How many games were decided because of a bad bounce? A missed kick? A dropped pass? The winners write the history books, but the devil is in the details. So let’s talk about playoffs. First, let’s look at a very rough outline of Tom Brady’s playoff games. Here, we’ll look at the opponent’s defensive DVOA ranking, Brady’s QB Rating and then QBR starting in 2006, and the score of the game. I’m going to highlight the things most important to me and add some other important tidbits. 1) In the 3 years the Patriots won the Super Bowl, Brady had 3 games with a passer rating over 100. He played 4 top 10 defenses, and had 1 game where he demolished a very stout D (in Pittsburgh in the 2004-05 AFC Championship). It’s not shown here, but he threw for 216ypg with a YPA of 6.4 with 11 TDs and 3 INTs in those games (numbers skewed a bit by the half he missed against Pittsburgh). His teams ran for 116 yards per game. His defenses were ranked 13, 2, and 7 those years. The Patriots were 9-0. In the 3 years the Patriots won the Super Bowl, Tom Brady may have been the world’s greatest…game manager. 2) In his first playoff loss in 2006, Brady shows he is human by throwing a game-changing interception in the end zone to Champ Bailey. The following year, he plays poorly against the Chargers but is bailed out (more on that later) and loses to Manning in Indianapolis. Two years of negative milestones. 3) Trying to attain the first 19-0 season in history, the Patriots endure a complete Brady stink-bomb against San Diego before having their record-setting offense held to 14 points by a Giants defense with perhaps the greatest game-plan execution in the history of football. Now Brady knows what it means to be Belichicked. 4) After 2 disastrous performances in the 2010 and 2011 playoffs leading to one-and-done exits against the Ravens and Jets, Brady has what I believe to be his most underrated season in 2011-12. He drags a horrific defense and non-existent running game to the Super Bowl, where he loses to the Giants again despite a mostly solid performance. He struggles in the AFC Championship game, but the Ravens had the best defense in football that year. Then in 2012, the Ravens manhandle Brady and send him packing. 5) After the magical 9-0 start, Brady and the Pats are 9-7 in the playoffs. 1) It takes Manning three years to get the monkey off his back. A year after being pounded to death 41-0 at the Meadowlands, he finally wins his first playoff games with 2 thrashings of Denver and KC. He is Belichicked in Foxboro, his first loss matched up with Brady. He does not play well. 2) After breaking the NFL TD record, Manning throws for 458 yards and 4 TDs against the NFLs 5th rated defense. He then is abysmal against Brady and the Pats. The rumblings are official – Manning can’t win the big one. 3) After losing a game against Pittsburgh in 2006 that had almost nothing to do with his poor play and more to do with his drunk, idiot kicker, Manning wins the big one. He mows down the number 1, 7, and 6 rated defenses and finally beats Brady in a game that matters. Get ready for a dynasty. 4) The dynasty is on hold as Manning suffers 2 bone crushing losses to the Chargers in consecutive years. In 2010, he loses his second Super Bowl appearance, in no small part to a pick-six that sealed the game. Was it his fault or Reggie Wayne’s fault? In most people’s mind, it doesn’t really matter. 5) It’s 2 more one-and-dones, losing by a combined 4 points to the upstart Jets and eventual champion Ravens (the same ones who crushed Brady 1 week later. Since starting 0-3, Manning’s playoff record is 10-8. You can’t tell a lot from this table alone, but you can see a couple of things I think are very important. Both QBs have had some terrible games. Both have lit teams up. They’ve beaten great defenses and gotten beat up by great defenses. Manning has slightly better passer ratings and QBR and has played a slightly tougher slate of defenses, but its tough to know exactly how well their opponents were playing in the playoffs. What matters most to me is their record in close games. Brady’s Patriots are 8-4 in games decided by 1 TD or less. Manning’s teams, on the other hand, are 2-7. What does this mean exactly? It means that in games where one bounce of the ball can change a team’s fortune, where one drop, or one missed kick, or one bad punt can win or lose a game, Brady’s Patriots usually came out on top. Manning’s teams did not. Do you think having the greatest coach in the NFL would help in those situations? Do you think having the greatest clutch kicker in NFL history would help? Let’s play the what if game. What if Mike Vanderjagt could hit a last second kick? What if Craig Hentrich didn’t shank a punt in the 4th quarter? What if Marlin Jackon doesn’t commit a face mask penalty? What if John Kasay doesn’t kickoff out of bounds? What if the Denver secondary knew how to cover? What if Marlon McCree doesn’t fumble that interception? Now, one could also say “what if there is no Helmet Catch” or “what if Rex Grossman wasn’t…himself?” And, of course, that’s all true. But my point is that when comparing two teams with large differences in games that are essentially a coin flip, you have to take everything into account. You can’t simply say “this guy won, ergo he is better.” Again, this is not tennis. If just a few of those plays go a different way, the Manning/Brady discussion would be very, very different. Brady clearly has to win the playoff record battle. But if you actually look at what happened during those wins and losses, the disparity looks a lot smaller than on the surface. Make sure you check out the 4th and final installment of my Brady vs Manning breakdown, where we cover cold, hard numbers and warm, fuzzy intanglibles. Steve Caronia is a New York City based physical therapist. The Jets 3 victories over Brady and Manning rank pretty high on his all-time great sports moments list. Get With The AFR Program!